The Dementia Friendly-Hospital Charter has been updated to now include a section on the important role of hospital volunteers. It is aimed at staff and volunteers in hospitals, and takes into account the latest guidance and the NDAA's updated Dementia Statements. Sign your hospital up to the Dementia Friendly Hospital Charter. Working with clinicians and policy-makers, the Dementia Action Alliance has drafted a Dementia-Friendly Hospital Charter to support hospitals to fulfill their commitment to become dementia-friendly. This started in October 2012 with the Right Care: a call to action to create dementia-friendly hospitals. All acute trusts in England were asked to make a public commitment to becoming dementia-friendly. 164 acute and non-acute trusts made that commitment with 88 submitting Action Plans and joining the Dementia Action Alliance (DAA). 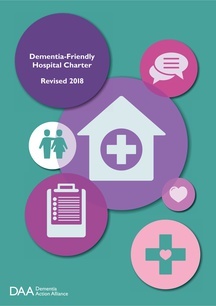 The Charter is in its second phase and has been renamed the Dementia Friendly Hospital Charter. It provides high level principles of what a dementia-friendly hospital should look like and recommended actions that hospitals can take to fulfil them. In the Prime Minister’s challenge on dementia 2020, one of the key aspirations is to create dementia friendly hospitals. All hospitals, public and private, are asked to sign up to the charter and to commit to real action to turn it into a reality.